In this July 13, 2018, photo, Attorney General Jeff Sessions delivers remarks in Portland, Maine. The New York Times rushed to Attorney General Jeff Sessions’s defense after a series of critical tweets from President Donald Trump in an editorial Tuesday. “By now, few might lift an eyebrow at President Trump’s crusade to delegitimize his own Justice Department and, specifically, his attorney general, Jeff Sessions,” the paper writes. The Times’ defense of Sessions is an abrupt change from previous editorials, starting from when he was first nominated in January 2017. When Trump first nominated Sessions, the Times’ editorial board questioned whether he was even fit to serve as attorney general and called on Democrats to delay his confirmation hearings. 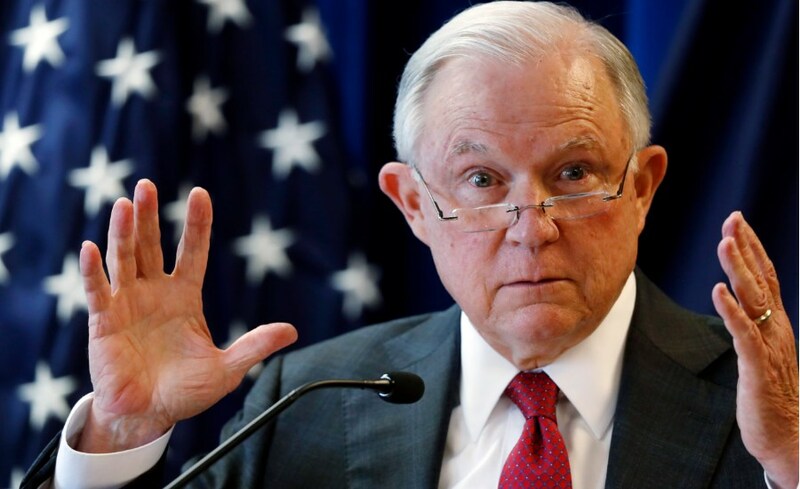 “The attorney general is too important an office, and Mr. Sessions’s views are too extreme — as Republicans themselves saw 30 years ago — to allow his nomination to sail through without a fight,” the editorial read. The Times might not appreciate how or why Trump is presently attacking his attorney general, but it’s amazing to pretend like members of its editorial board wouldn’t want to see Sessions replaced as well. OF COURSE the Fake New York Times is supporting Sessions. It really isn’t hard to figure out that Sessions, with the able assistance of the FNYT, wrote the anonymous op-ed. Sessions has been trying to destroy Trump’s presidency since Day 1. Whatever the rhyme, reason (or treason) affecting our formerly stalwart Jeff Sessions while causing him to be AWOL within the culture war now raging for our republic’s struggle to return to a modicum of “truth, justice, and the American way” –an endorsement from Deep State Central (NYT division) is not the way to patch up and make nice with Lady Liberty. Let us continue to pray for Brother Jeff—and our President!